HomeEnvironmentAn Innovative device ‘WAYU’ aims to eliminate air pollution from urban traffic. An Innovative device ‘WAYU’ aims to eliminate air pollution from urban traffic. India may be lagging behind China on several economic indicators but when it comes to environmental degradation, the country has definitely outsmarted its giant neighbor. Of the world’s top 20 polluted cities, 13 are in India compared to just three in China. Air pollution slashes life expectancy by 3.2 years for the 660 million Indians who live in cities, including Delhi. In China, the corresponding dip is marginally lower at three years. In an effort to reverse years of policies that have made Indian cities some of the most polluted in the world, India has launched its first air quality index. Prime Minister Narendra Modi launched the index, which will initially monitor the air quality in 10 cities. Those cities include Delhi, Bangalore and Hyderabad and will eventually total 60. The index is part of Modi’s Clean India Mission, a campaign to improve the environment and quality of life for the country’s citizens. “We are trying to think of ways of reducing carbon emissions, but we are not thinking of changing our lifestyle. Unless we bring a change in our lifestyle, we will not be able to save the environment," Modi said. Did you know that over a 40-year period, one tree will remove 600 pounds of carbon dioxide, a major greenhouse gas, from the air? Clean air is essential to our health and to the environment. But since the industrial revolution, the quality of the air we breathe has deteriorated considerably - mainly as a result of human activities. Rising industrial and energy production, the burning of fossil fuels and the dramatic rise in traffic on our roads all contribute to air pollution in our towns and cities which, in turn, can lead to serious problems for both health and the environment. Air pollutants take a steep toll on human health. Significant reductions in air pollutants will save thousands of lives—especially in at-risk communities. 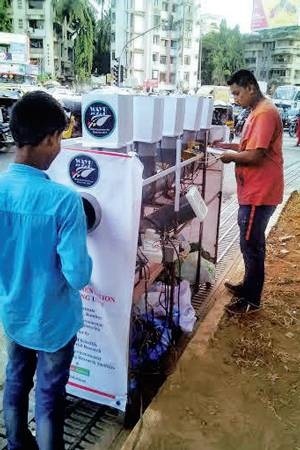 In order to eliminate the pollution from the air, an innovative device is developed by collaboration of IIT-B, NEERI E-Square Solutions and MPCB named WAYU is awaiting State Environment department's green signal, as published in Mumbai Mirror. In a bid to bring down the high level of pollution found at traffic intersections in the city, IIT-Bombay and National Environmental Engineering Research Institute (NEERI) have come up with a device named WAYU. A pilot test has already been run successfully, and WAYU or Wind Augmentation and Air Purifying Unit might soon receive a green signal from the State Environment department as well. The device, which can also be run on solar power, is an active air pollution mitigation technology working on the principle of breaking down carbon monoxide and Volatile Organic Carbon (VOC) into carbon dioxide. The project is the result of a collaboration between IIT-B, NEERI, Maharashtra Pollution Control Board (MPCB) and E-Square Solutions. On the occasion of the World Environment Day on Friday, the prototype was shown to State Environment Minister Ramdas Kadam. He asked for more details and promised that if he was satisfied with the results and the working of the device, it will be installed at 100 locations for further testing. Dr Rakesh Kumar, chief scientist and head of NEERI, said their studies pointed out growing concerns over heavy pollution level in the city, especially that of carbon monoxide at busy traffic intersections. He said, "The problem of air pollution multiplies at vehicular intersections as a vehicle typically accelerates, remains idle and decelerates when it comes across intersection and this causes higher amounts of pollutants to be released in the atmosphere. These pollutants get trapped leading to higher exposure for people stuck in traffic, or living or working in buildings surrounding the intersections." Explaining WAYU's working, Padalkar said the device works basically on two principles, wind generation for dilution of air pollutants and active removal of pollutants. "In WAYU, the air passes through a thermal oxidiser, which heats up the air, breaking the carbon monoxide and VOCs into carbon dioxide. We can run this device on solar energy and the next set of tests will be done using only solar power," he said, adding that the device can be made bigger to serve a bigger area. "This is a very simple, low-cost yet effective technique to tackle pollutants, particularly carbon monoxide and particulate matter. During the study, we found that the carbon monoxide level in the range of 7-8 ppm during peak hours was reduced to 3.5-3.8 ppm, while particulate matter in the range of 260-350 mg/m3 was found to be reduced to 100-130 mg/m3 in the 20-30 metre radius," said Dr Kumar. He added the device will be further refined to make it sleeker and more user-friendly, so that it can be installed on the median dividers at congested junctions such as Sion, Andheri and other locations in Mumbai.